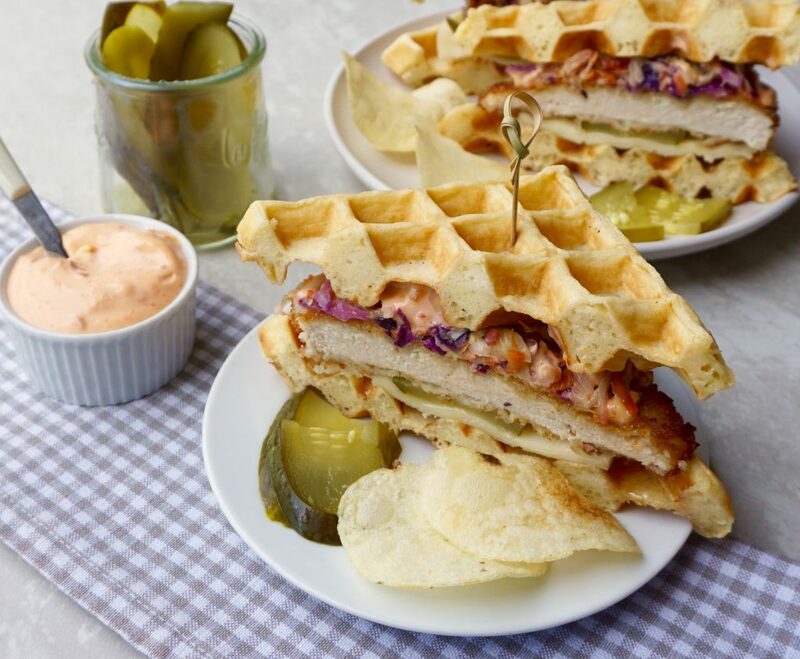 This Fried Chicken Waffle Sandwich came to me as a photo. Two of my favorite people, Kaitlin and Colin had made it for dinner and they texted me with it. I could tell just by looking at it that it was going to be an epic sandwich and I was not wrong! 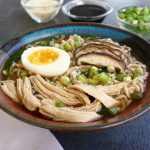 There are several layers of ingredients which produce lots of flavor! It has sweet, spicy, cheesy, and crunchy components on top of a fried chicken cutlet. 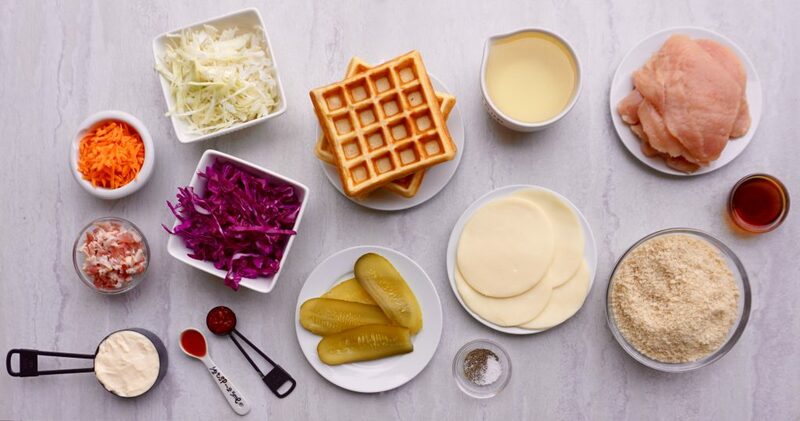 All of this is placed between two waffles. I asked for them to send me the ingredients to make this. I could vision it as the star at a Super Bowl party. I took the ingredients and turned it into a recipe to make 4 servings. It is going to require a little time and effort but it is well worth it. It is such a good sandwich. Just make sure that you buy some super long toothpicks to hold it together when you try to slice it! If you are using a mix for your waffles, follow the instructions on the box to make 8 waffles. If you are using frozen waffles, take them out to defrost. For waffles from scratch, add the flour, baking powder, sugar and salt to a large bowl. Combine well. In a medium bowl, whisk the eggs. Add the milk and oil and mix together. Add all at once to the dry ingredients and combine well. Preheat your waffle iron. Spray it very heavily on both the top and bottom with cooking spray to avoid sticking. Add your waffle batter (either from mix or scratch).Cook until your waffle makers indicator light shows that the cooking is complete or until steam no longer comes out. They should be a light golden brown and soft. Place the bacon in a large skillet and cook over medium low heat until it is starting to crisp and all of the fat has been released. Add the red cabbage, green cabbage or Brussel sprouts and carrot. Cook for 3-4 minutes if you want a slight crunch to the slaw or longer is you prefer it to be softer. Remove from the heat and set aside. In a small bowl, mix the mayonnaise with the hot sauce and chili garlic sauce. Taste. This sauce will have a mild kick to it. 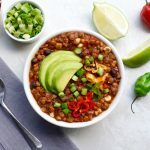 If you like spicier foods, add more hot sauce and chili garlic sauce, ¼ teaspoon at a time until it is as spicy as you like. Slice the chicken cutlets through the center from left to right to form two cutlets of equal thickness. Pound slightly and trim so you have cutlets as close to your 4 inch waffle size as you can. In a pie dish, beat the egg and water together. Place the flour in a shallow bowl and season with salt and pepper. Place the Panko crumbs into a pie plate or a shallow bowl. Dip the chicken cutlets into the flour and coat thoroughly. Next dip the cutlets into the egg mixture and make sure they are thoroughly coated. Dip the eggs into the Panko crumbs and press down to make sure the crumbs adhere evenly to the entire cutlet. Heat the canola oil in a large skillet over medium low heat. Drop a crumb into the oil and when it starts to cook the oil is hot enough. Add the cutlets to the pan and cook for 3 –4 minutes on each side. The cutlets should be a light golden brown and cooked through. Place 4 waffles on a cutting board. 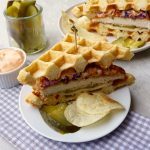 Add a slice of provolone cheese to each waffle, then add a slice of dill pickle. Next add two tablespoons of the spicy mayo to each waffle and top with a chicken cutlet. 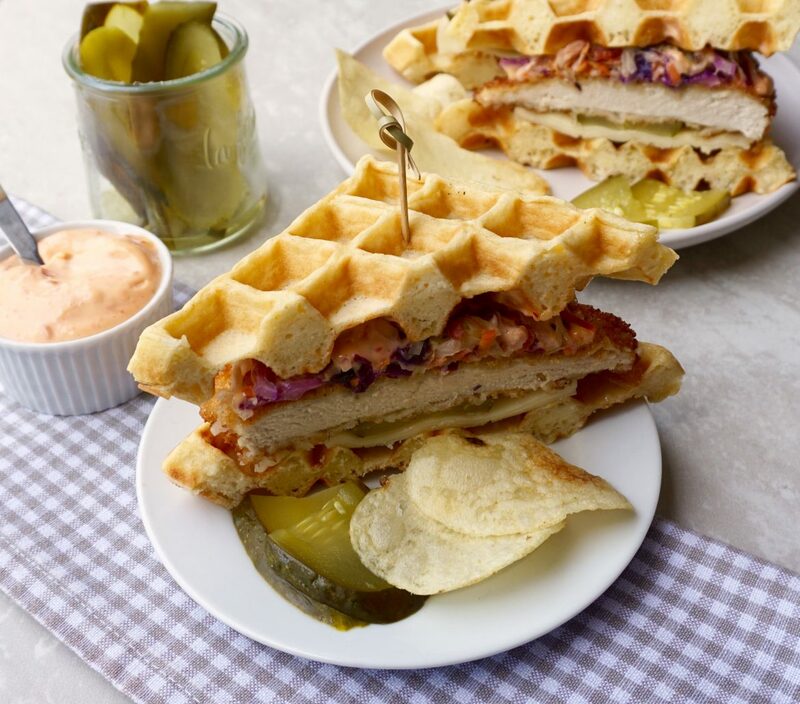 Pour ½ tablespoon maple syrup over each chicken cutlet and then spoon ½ cup of the Bacon Slaw over each one. Top with another waffle. If this is made when the cutlets are very hot, the cheese will melt a little. If not, place the sandwiches on a baking sheet and put into a 350 degree oven for 5 -10 minutes, checking to see when the cheese has melted.